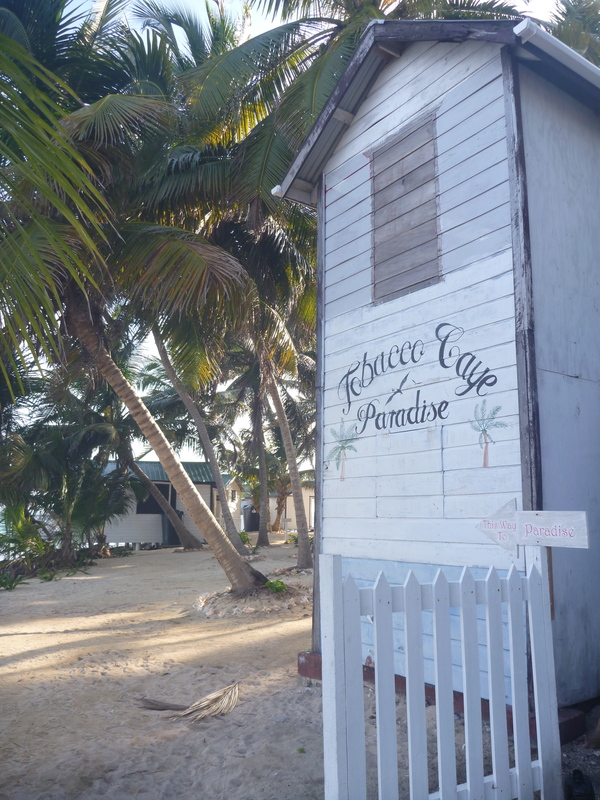 Snorkelling and Sailing the Belize Barrier Reef… You Better Belize It. 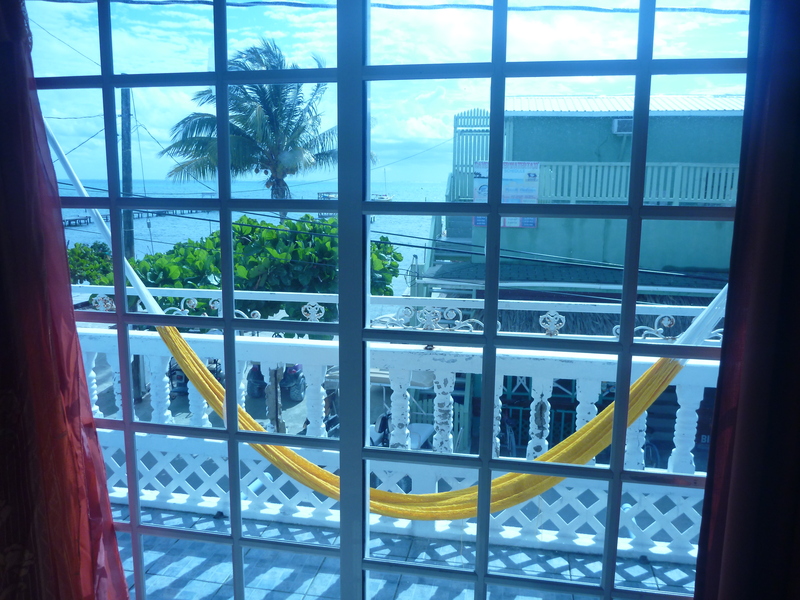 Monday morning began with our arrival in Belize City! 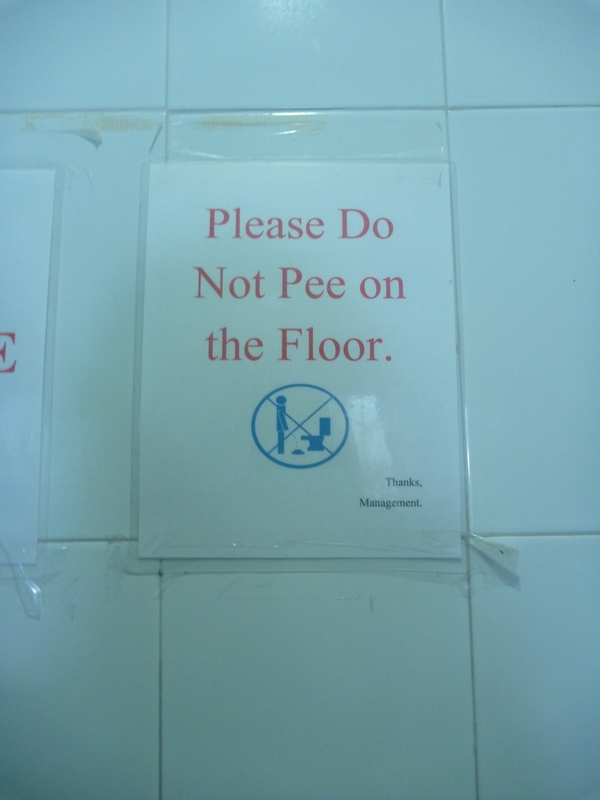 Our plan to “walk” to the water taxi from the bus station was ditched once we realized that the city was just a tad bit sketchy. After noticing that there were no side walks or street signs we decided that it would probably be best to grab a taxi rather than take our chances and end up getting lost and robbed on a side street (ok, so I may be exaggerating here). The cab we were originally going to grab out front of the bus station was full so the driver randomly waved a beat up car over and ensured us that it was ‘safe’. 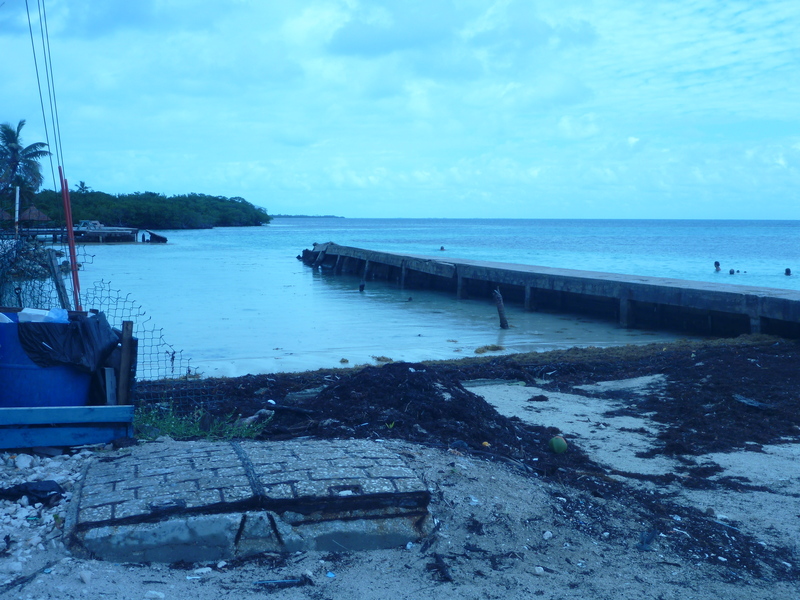 The driver in the beat up, unmarked car said he could take us to the water taxi for $3 US each (now THIS was sketchy). While our driver meandered through the streets, we only hoped he was actually taking us to the water taxi and not some random unknown location (gee, how imaginations can run wild). We checked our bags, bought our tickets and enjoyed a banana lassi (sorta like a milkshake) from an Indian restaurant. 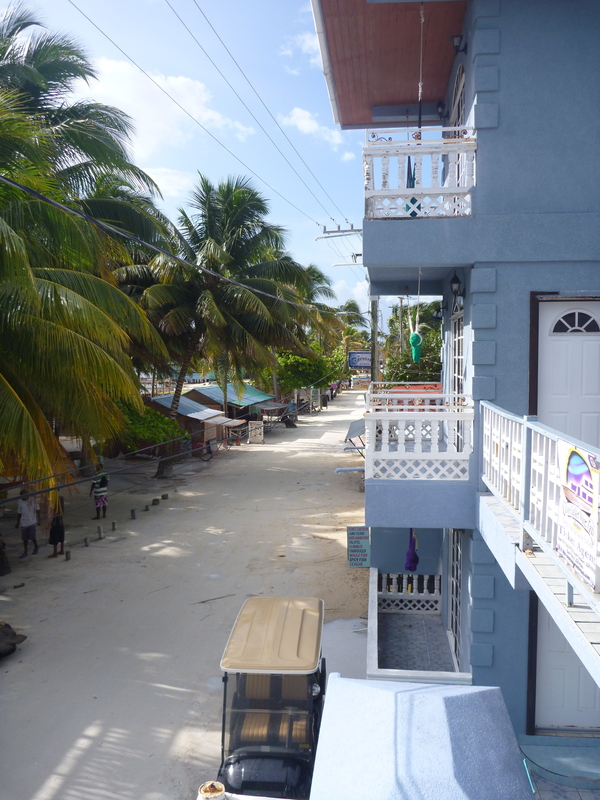 The boat ride to “Caye Caulker” was only about 35 minutes and after our long night’s journey we were happy that we were able to check into our hotel on the island early. 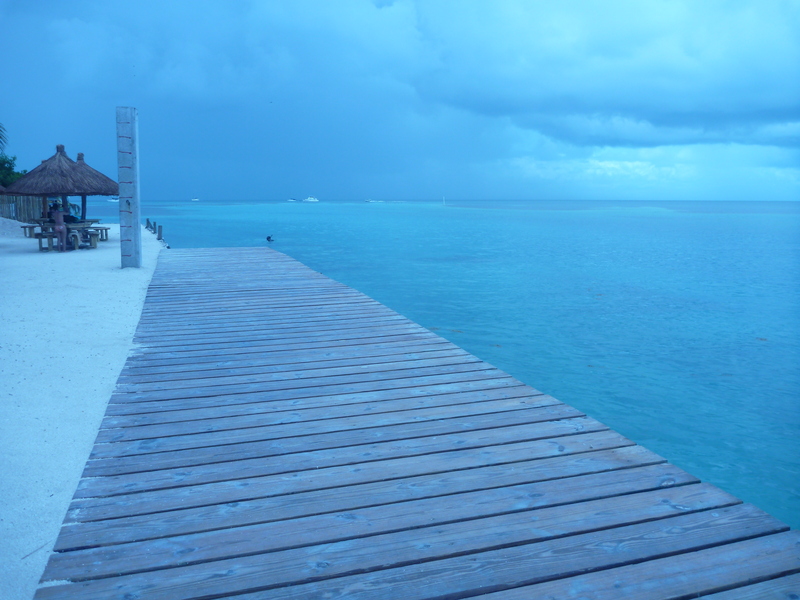 We stayed at the “Barefoot Island Caribe Hotel” which had a great view! After a much needed nap we took a walking tour of the island. There aren’t actually any beaches here on the island so everyone heads down to a place known as “The Split” to go swimming. 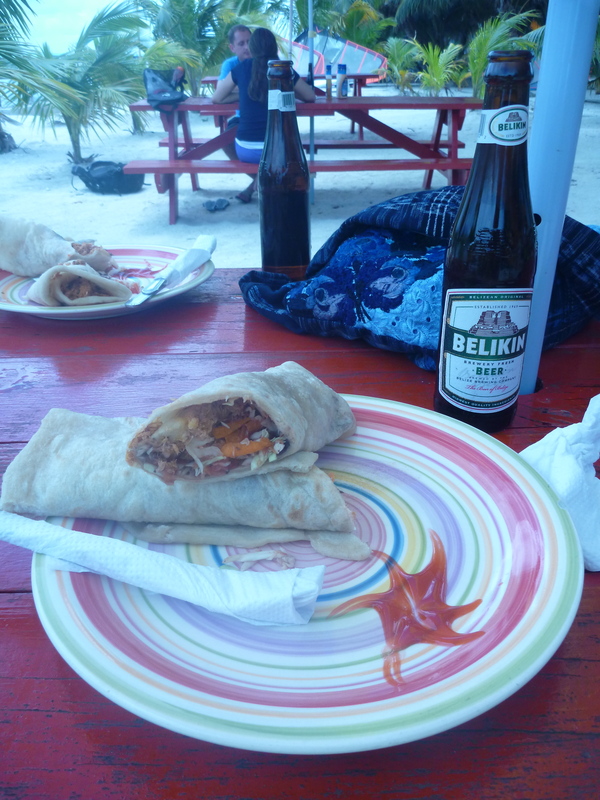 We followed that up with a late lunch, mmm mmm fish burritos paired with a spectacular Belizean beer. From here we headed to “Raggamuffin Tours” for a meeting about our sailing/snorkelling trip that we’d be departing on the next day. 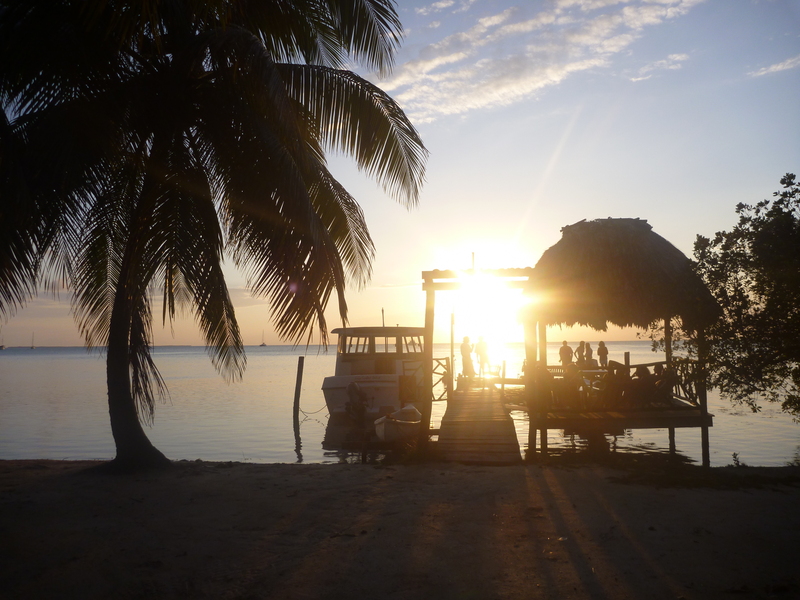 After our meeting, we took a stroll to the other side of the island to watch the sunset, and then we headed back to the hotel to meet our third traveller Megan who had just arrived! For dinner we found a really cool spot called “Barrier Reef Sports Bar and Grill.” We encountered some Canadian’s (the first we’d run into on our trip so far), a group from Toronto who were sitting next to us. Although the service was extremely slow here, the food was pretty good! 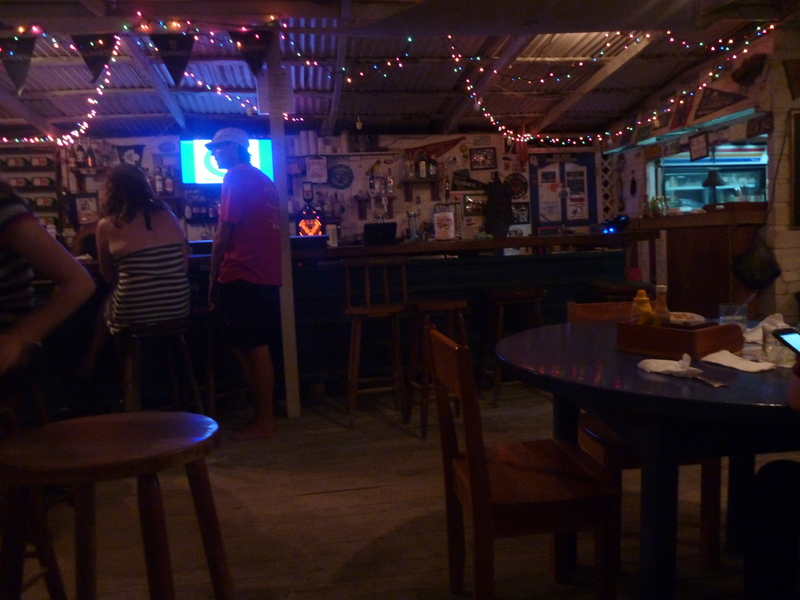 The restaurant even had that whole island like vibe which was pretty cool. In the morning we headed to a little place called “Glenda’s,” which was basically a very small restaurant that this lady had in the front of her house. When we arrived, there were other local’s waiting out front for her to open up (I took this as a sign that this place must be good!). Once she opened we all got some of her fresh, homemade, still hot – cinnamon rolls for 50 cents US. Hot dang they were good! 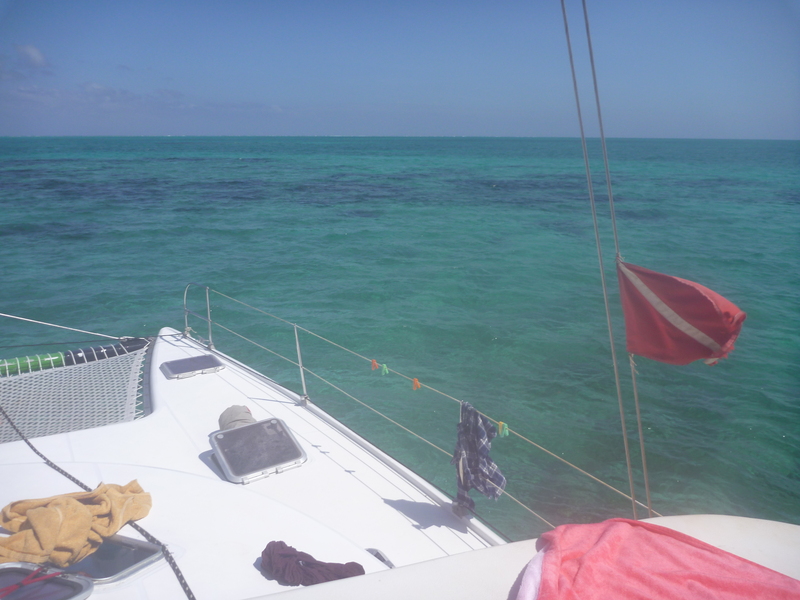 Afterwards we grabbed our bags from the hotel, boarded the “Raggamuffin Tours” catamaran and began our 3 day sailing/snorkeling journey along the barrier reef (2nd largest in the world). 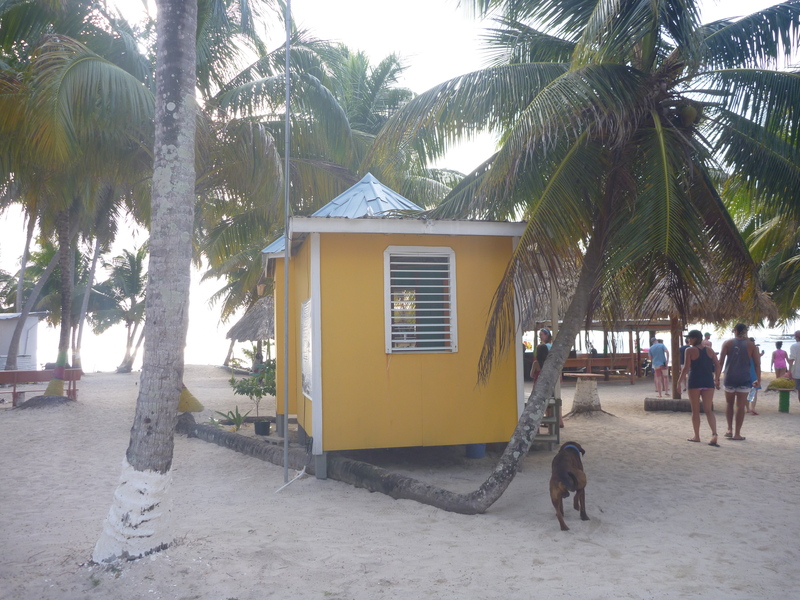 The guides were great and they guided us on our snorkelling adventures every time we stopped, diving down to point out different kinds of fish, plants and coral. 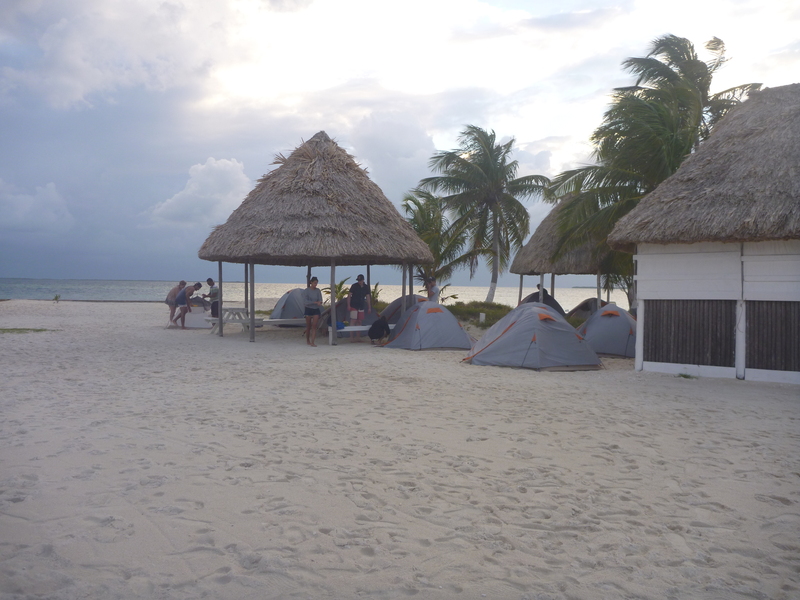 Late afternoon we arrived at our first camping destination, Rendezvous Caye. 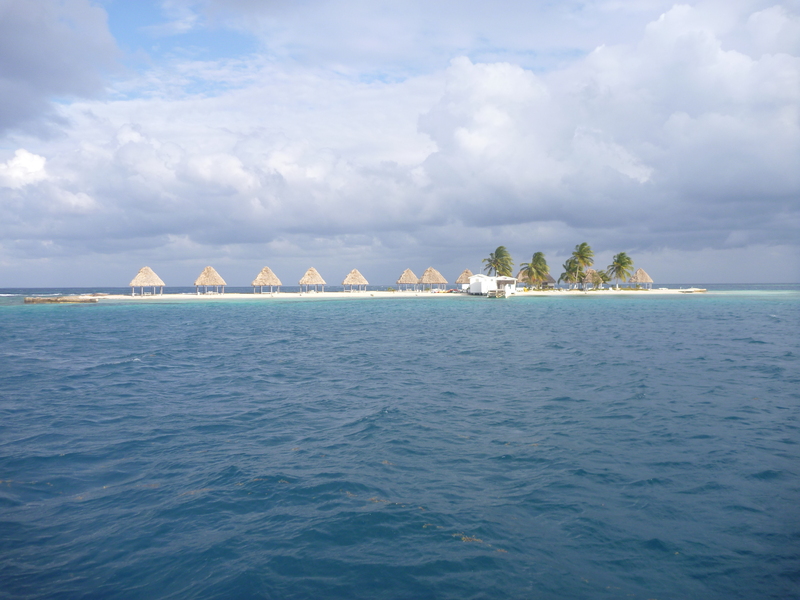 Oh yes, we stayed for the night on the island seen in the picture below, ahhh paradise. This island gets it’s name from the fact that in olden days pirates use to head out to rob people and then afterwards they would rendezvous here on this very island. After setting up our tents, we had an absolutely AMAZING dinner that the crew had cooked up for us. Fillet and steak Barracuda (caught that day by a traveller on the back of the boat), veggies, rice, chicken and shrimp ceviche with chips. 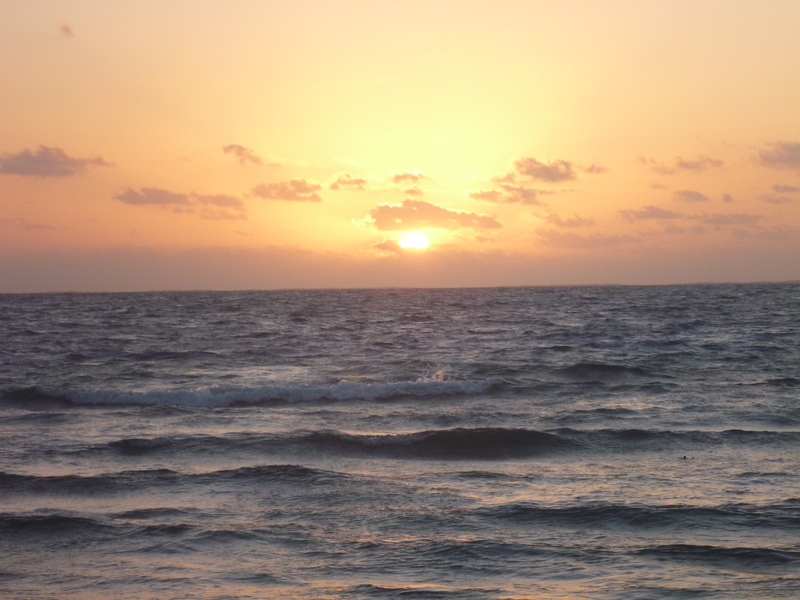 The next morning we woke up at 5:30am to watch the sunrise, what a view! Wednesday had a few different snorkelling stops. 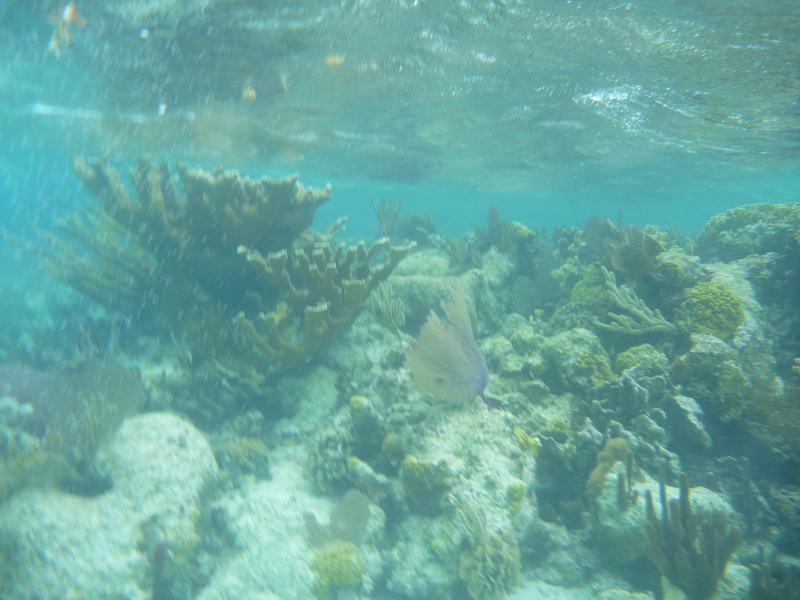 Our guide took us out snorkelling with a spear gun (which I got to try shooting!) 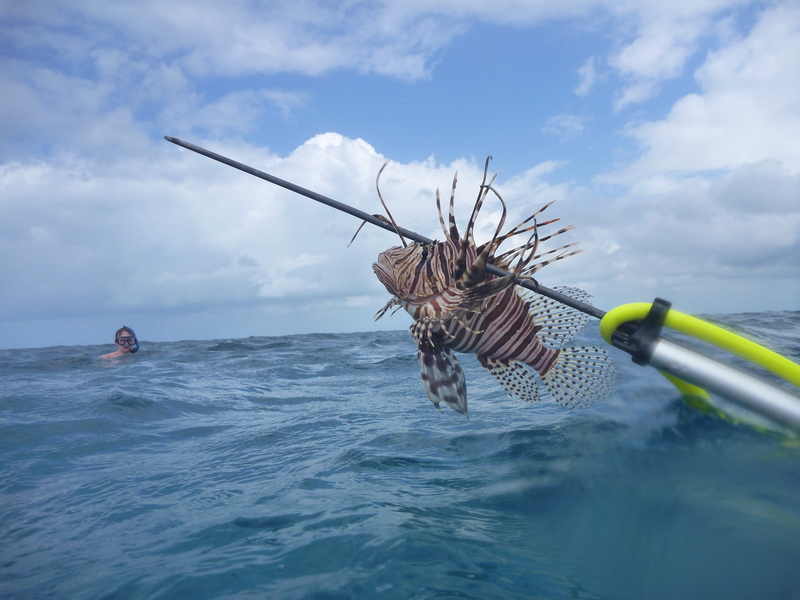 and he caught a lion fish which we got to look at up close. 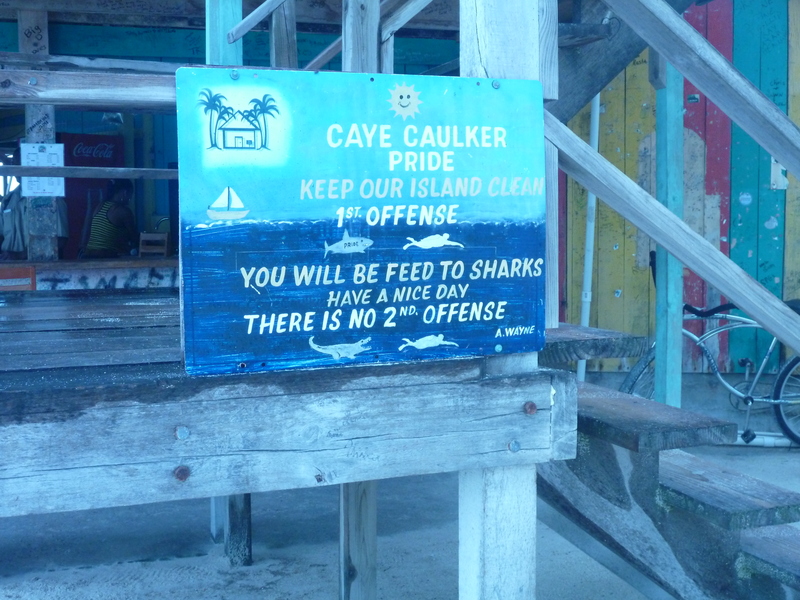 Apparently these fish are wreaking havoc on the reefs as they are eating the smaller fish which the reefs need to survive, such as the small reef cleaning fishes. 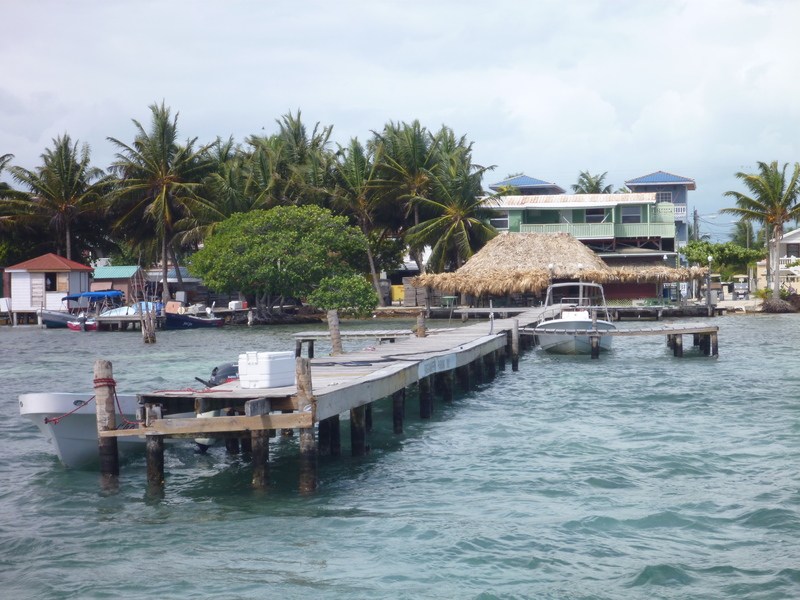 Later that day we arrived at the second island we’d be staying on in our journey, Tobacco Caye. 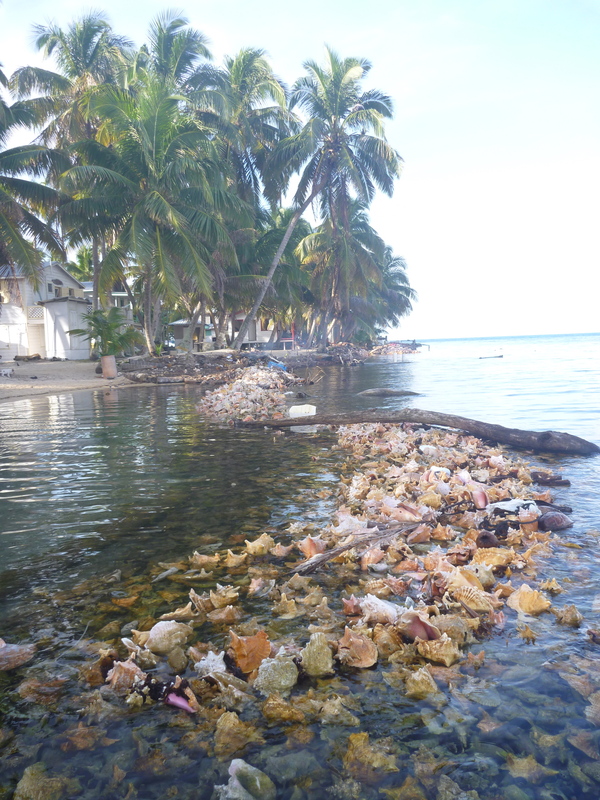 This island had so many conch shells, everywhere! 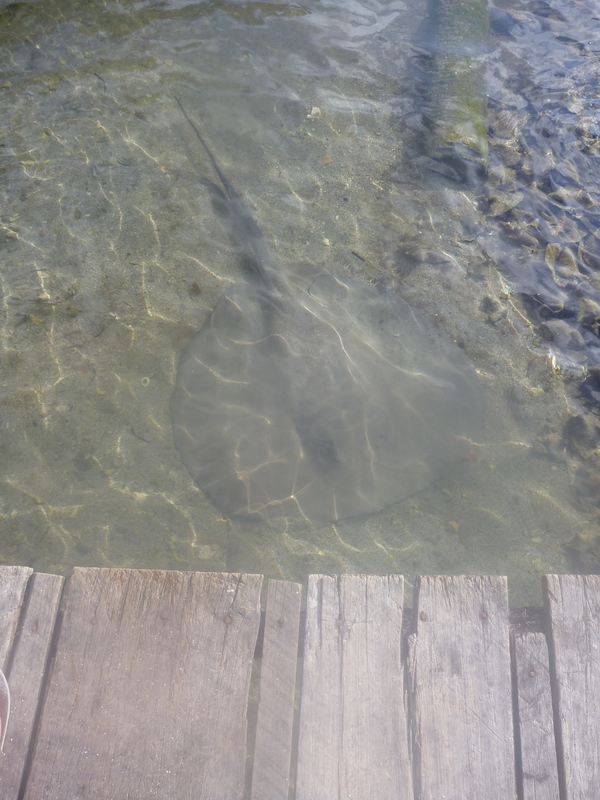 They even had sting rays swimming close to the dock near the shore. 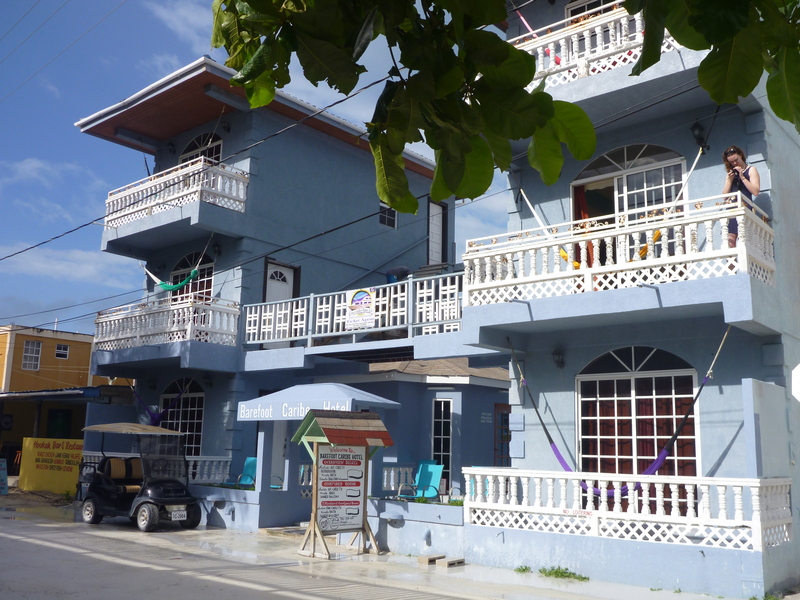 That evening we had another amazing dinner, this time the highlight was conch ceviche which they had made after fishing out a bunch of conch shells during one of our snorkelling stops earlier that day. 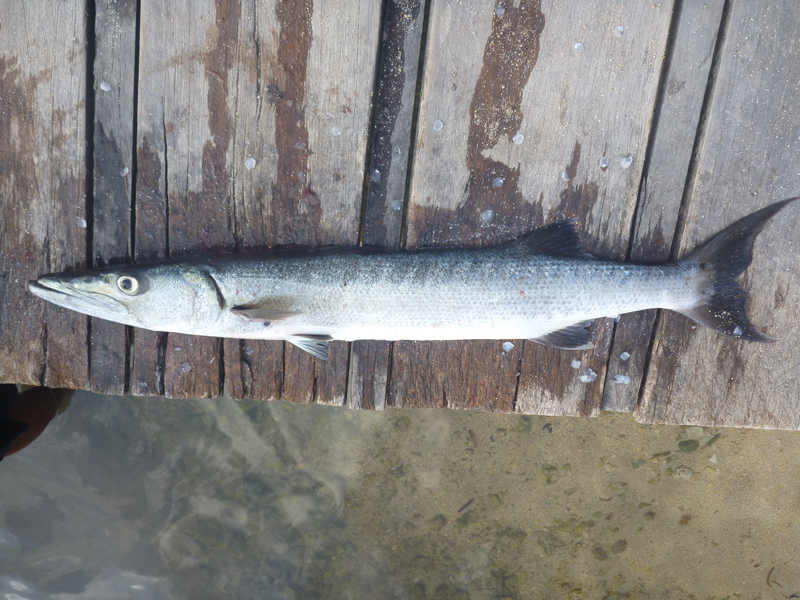 We also had Barracuda again! 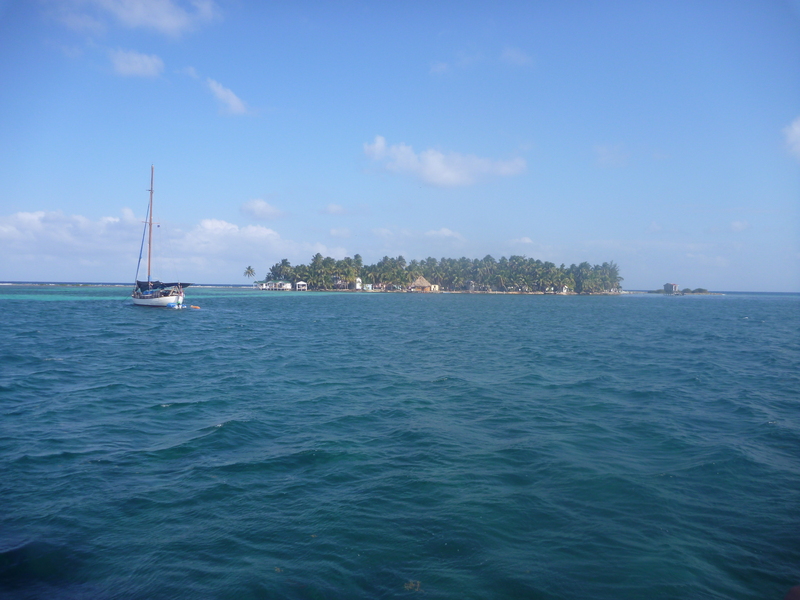 The last day on our trip with Raggamuffin was full of sailing with a couple stops to swim/snorkel before we arrived in Placencia. 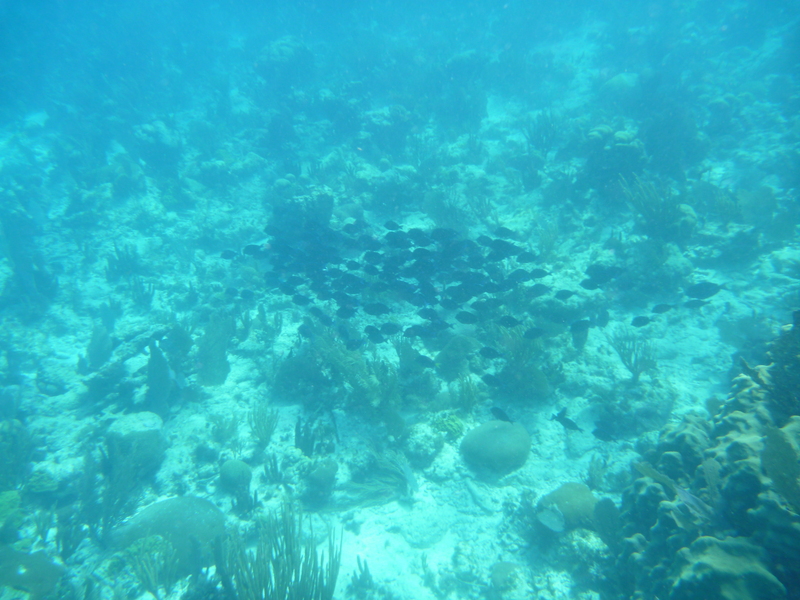 We even got lucky and saw an Eagle Ray (also what they call Nemo’s school bus). 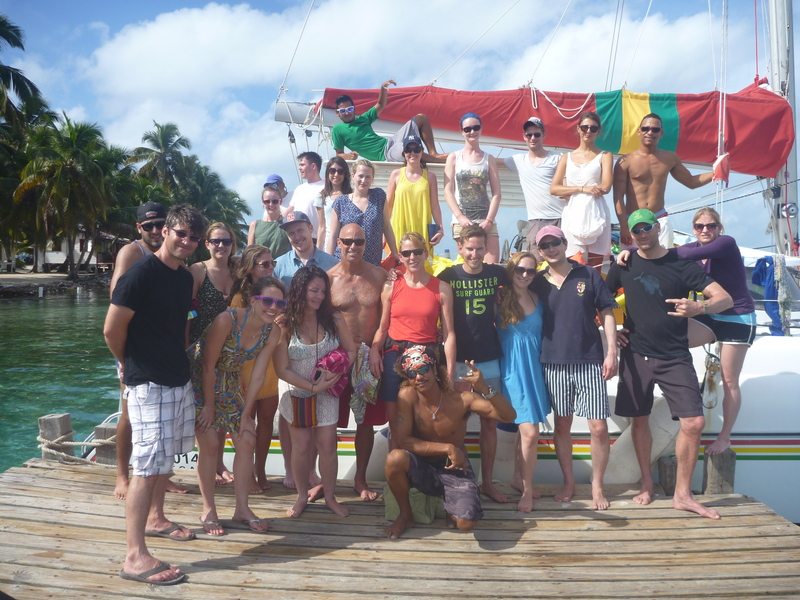 We took a group shot of the whole crew before we left the island. The guys that ran this tour (Captain Kevin, First Captain Elio, Second Captain Vito and First Mate Javier) did an absolutely amazing job. 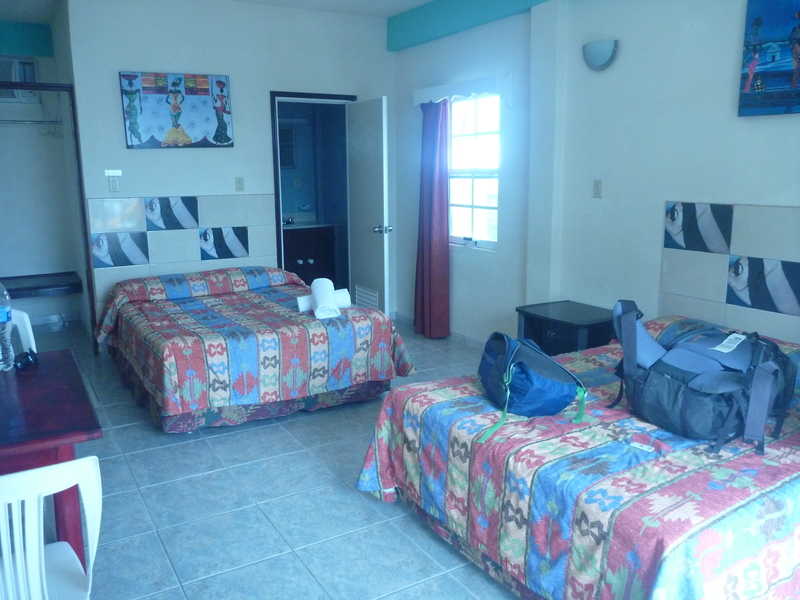 They even took the opportunity to sit down with some of us to get to know where we were from and they also shared some stories about their lives in Belize. Meeting some really great fellow travellers from around the world was also an awesome experience (USA, England, Denmark, Switzerland, Germany). 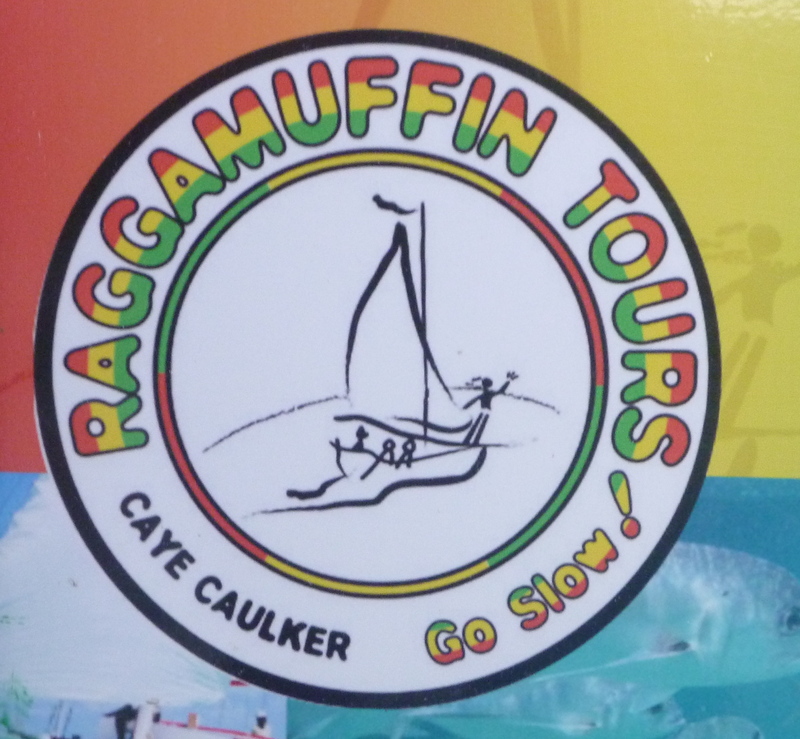 I was impressed with how well everything was done, if I had to rate Raggamuffin Tours, they would definitely get 5 stars!